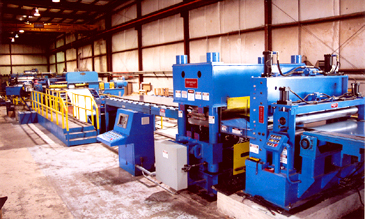 Indianapolis, IN – Lafayette Steel Sales has installed a Hydraulic Leveler/Precision Servo Feed Cut-to-Length Line in its Indianapolis, IN facility. The line is capable of converting 50,000# x 72" wide cold rolled and galvanized carbon steel, aluminum and stainless coils in gauges from .018" through .135" into shape-corrected flat sheets from 24" through 240" long. 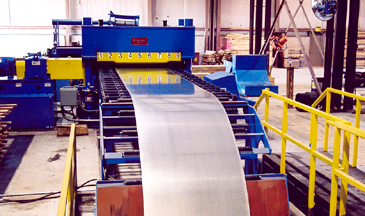 The line is equipped with a radio controlled Coil Loading Car, Shifting Base Uncoiler, Pinch Rolls, Entry Crop Shear, Computer Controlled Hydraulic Leveler, PVC/Interleaved Paper Applicator, Electronic Servo Feed, Hi-Speed Cut-Off Shear, Sheet Inspection/Reject Conveyor, and a 20’ Drop Type Sheet Stacker. 5-Hi Precision Hydraulic Leveler: The Lafayette Steel CTL Line is equipped with a massive 4-post precision 5-Hi shape-correction roller leveler equipped with seventeen 1.750" diameter work rolls supported by nine adjustable back-up flights. The back-up flights are positioned by 18-independently controlled hydraulic cylinders (9-entry and 9-exit) that provide work roll positioning and bending necessary for the elimination of strip shape defects such as coil-set, wavy-edges, and center-buckle. The hydraulic cylinders are controlled by a 2.80 GHz 40GB HD computer that precisely adjusts each cylinder via position data from linear voltage transducers installed in each back-up cylinder. Automatic Leveler set-up for various gauges is automatically accomplished based upon thickness and yield strength data input into the computer terminal by the operator. Work rolls can be re-positioned via computer inputs or pushbuttons while running. Via order or job number, the computer allows specific Leveler set-up parameters to be transferred to the computer memory, a time-saving feature when processing less-than-full coil orders. When the remainder of a coil is processed, the Leveler automatically sets-up to the work roll position previously employed to level that particular coil. Braner/Loopco Levelers employ no reversing motors, mechanical screw jacks, sliding wedges or tilting top frames to position the work rolls and back-ups. As a result, roll positioning is more accurate, and maintenance requirements are reduced. Periodical "calibration" of the Leveler can be accomplished in 5-minutes without any tools. Electronic Servo Feed: The Leveler runs at a constant speed feeding the leveled strip into a free-loop. Large radius non-marking quadrant tables support the strip into and out of the loop. 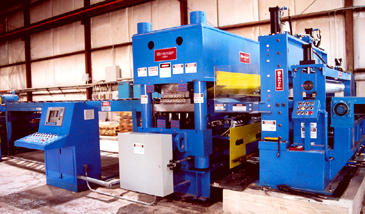 An Electronic Servo Feed draws the strip from the free-loop and feeds the strip to a pre-set dimension through the Shear for cut-off. A servo motor drives adjustable pressure upper and lower strip feed rolls through universal shafts. The strip feed length is precisely measured by an electronic encoder, while a microprocessor controls strip acceleration/deceleration. Sheet length and batch count are entered into a digital operating system. When compared to a mechanical "reciprocating mechanical feed", a Servo Feed has a higher "short-part" production rate. A Servo Feed is able to advance the strip immediately after the Shear completes its cycle, while a reciprocating mechanical feed shoves the strip forward, but must release the strip, slide the strip clamp backwards, and grab the strip again before it can start another cycle.